A day at Imago Dei begins early, with breakfast at 7:30, and goes late, until Study Hall is dismissed at 5:30. (Honor Roll students may leave earlier, at 4:00.) In between, there’s a lot to do, experience, and, most of all, learn. Breakfast, 7:30-8:00 The school opens at 7:30 as the school’s 70+ scholars begin to arrive by car and city bus and on foot. Staff members serve a simple, healthful breakfast every morning to all Imago Dei scholars who want it. Most do. Chapel, 8:00-8:30 School begins every day with Chapel. It’s a spiritually nourishing opportunity to settle, reflect, and focus on the day ahead. Morning Classes, 8:30-11:30 Scholars focus on academics during Periods 1-3. 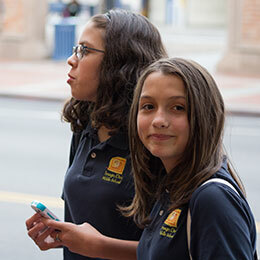 The school’s curriculum includes English, Math, Science, History, Religion, and PE, plus regular instruction in Art and Music, Spanish for 5th- and 7th-graders, Latin for 6th- and 7th-graders, Graduate Support and Advisory classes, and daily Enrichment. 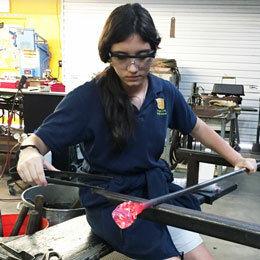 Enrichment, 11:30-12:30 The extended day, week and year allow time for experiences off and on campus, from sports and arts and crafts to dance, sewing, gardening, field trips, and much more. Eighth graders take part in Community Service as part of Enrichment. On Wednesdays, students attend Eucharist during this hour. Lunch, 12:30-1:30 Everyone’s favorite hour. Scholars enjoy fresh, healthy, tasty meals prepared by Johnny Gibson’s Downtown Market. After lunch, there’s a half-hour for play, indoors or out. Afternoon Classes, 1:30-4:00 Classes resume in the afternoon. 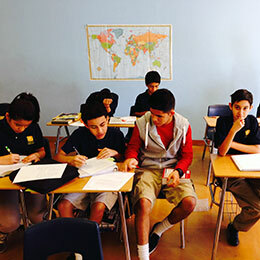 The Fifth and Six Grades are self-contained, while Seventh and Eighth Graders transition from one room to another during the day to help prepare them for high school. Students are released early on Wednesdays, so staff can meet and plan. Study Hall, 4:00-5:30 Study Hall, like Saturday School, is required for scholars with less than a B average; both are optional for scholars who have made Honor Roll. 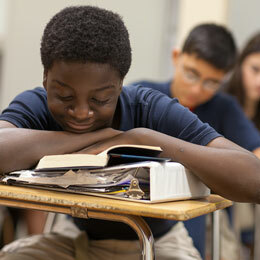 Study Hall is supervised by teachers who can provide homework help to those who need it. 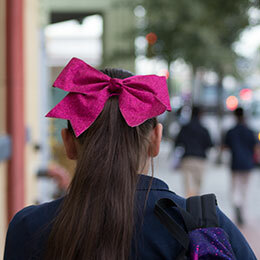 Dismissal, 5:30 Each day ends when students flood out onto the sidewalk and head for home. Tomorrow is another busy day.